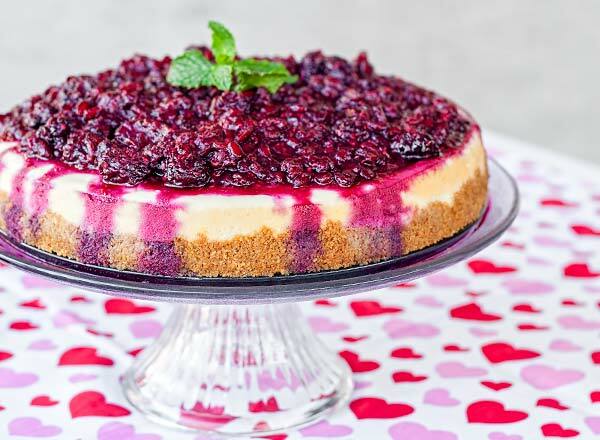 If you start searching the web you get all sorts of interesting informations about cheesecake. For example I had no idea that it was already a popular dish in ancient Greece before Romans adopted it. Well that’s if you believe everything you read on the web, I wasn’t there anyway. 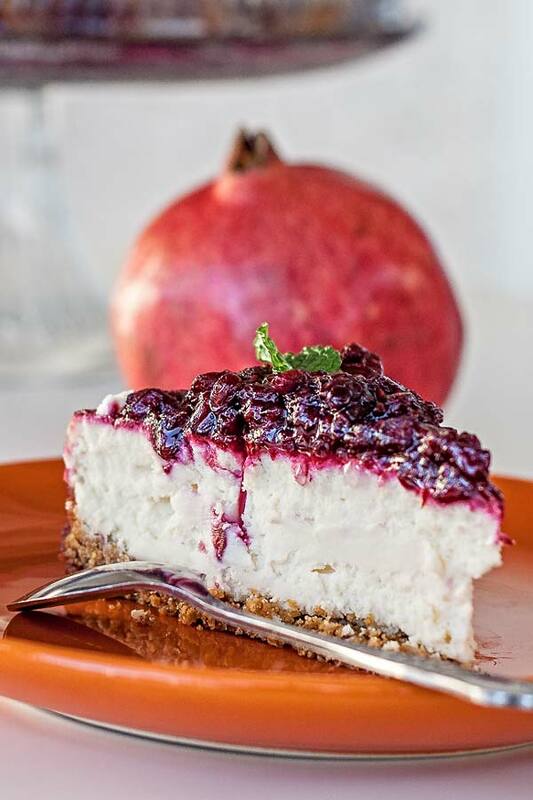 Still, no matter who invented it, the cheesecake is a beautiful desert and can be done in a multitude of variations… did I say delicious? Start with the crust which is very easy to make. You basically add all the crust ingredients to a food processor and mix&grind as fine as you want it. 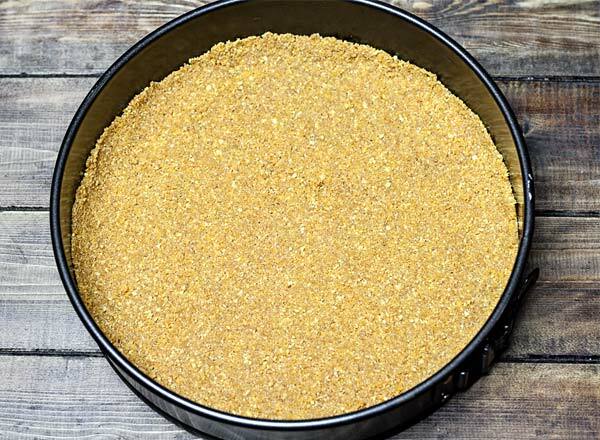 Then get this thing out and spread it evenly onto the bottom of a cheesecake pan, that’s a 9″ (23cm) in my picture. Pour the filling in the prepared cheesecake pan. Bake it for 15 minutes in a preheated oven at 350° F / 175° C, then turn down the heat to 250° F / 120° C and continue for another hour and a half. 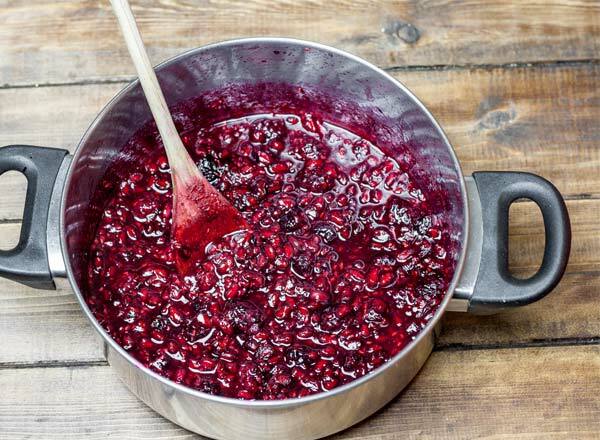 While the thing is baking you can start on your topping. 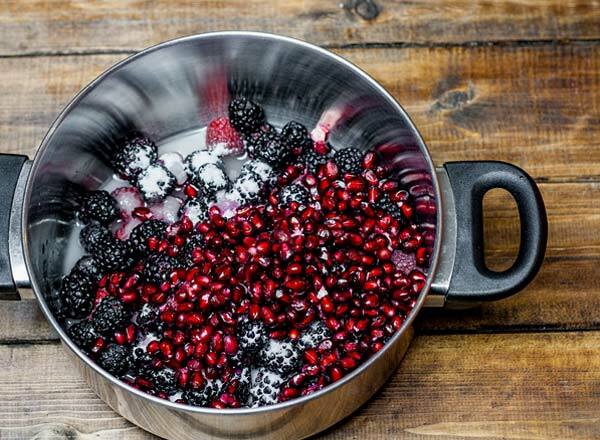 One cup of blackberries, one cup of raspberries and one cup of pomegranates seeds mixed with sugar and water in a sauce pan. Cook this on low/medium heat for about 15 minutes or until the sauce thickens up. 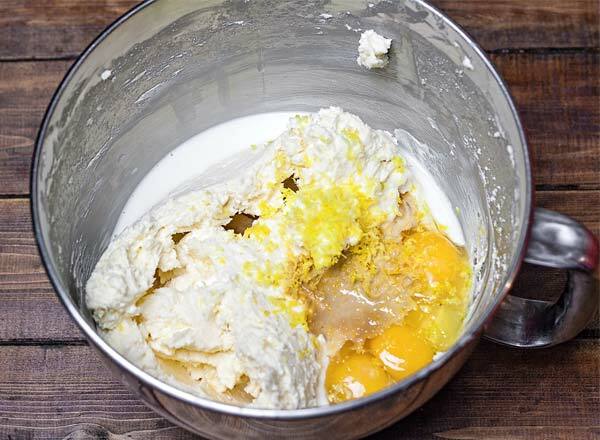 In a food processor, add the crackers, melted butter and sugar and mix & grind them as fine as you want. 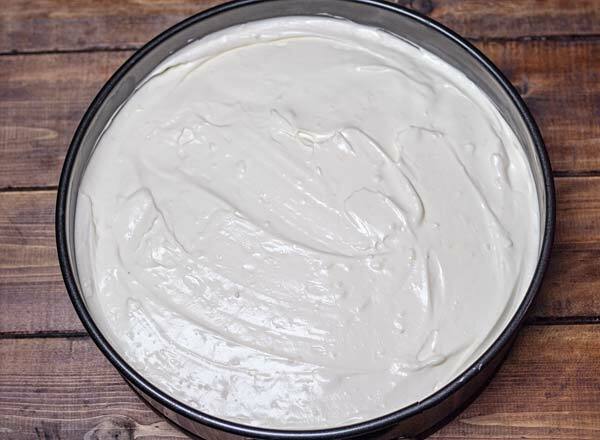 Take the mixture and spread over the bottom of the cheesecake pan, pressing down to cover the entire area going a little bit up the side. Place pan in the fridge while you’re making the filling. 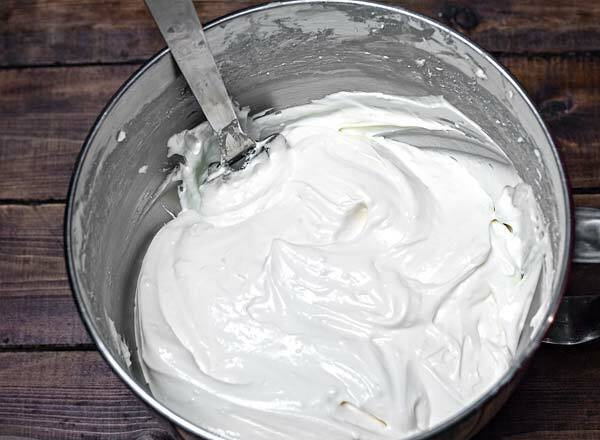 Filling – add the cheese, sugar and flour and swirl for two minutes on medium speed. Scrape down the sides of the mixing bowl, then add the remainder of the ingredients and mix again on medium for another minute or so. Filling should be very smooth. Pour the filling in the pan over the crust from second step, and bake in the oven for 15 minutes. After that turn the oven down to 250° F / 120° C and keep baking for another hour and a half. When done, let it cool for about an hour then let it rest for another couple of hours inside your refrigerator... I know, I was guarding my fridge too. Topping – Add the ingredients to a sauce pan and cook over low/medium heat for 15 to 20 minutes or until the sauce thickens up. Easy! 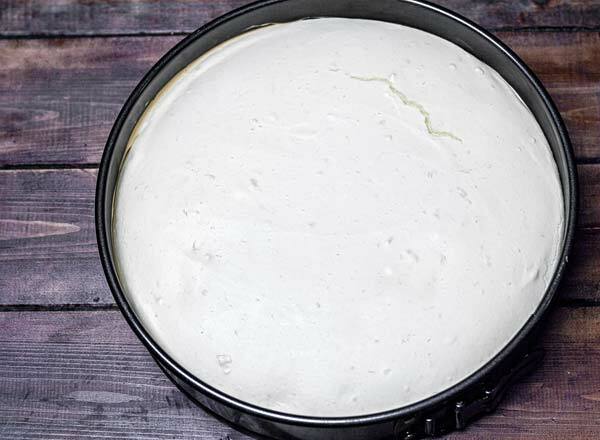 After cheesecake and topping are completely cooled, pour the topping on top of the cheesecake and be ready to fight the rest of the family for a slice. Hahahahah it is definitely delicious.